I could easily forgive the monsoonal rain storm which prevented me from lounging beachside and retreating indoors. Not only does Phuket's Indigo Pearl resort stand out as one of the best resorts in its class for comfort and service but these designer digs are truly eye catching. Every square inch of the public and private space here sparks conversation - like the striking peacock blue lounges and industrial objets d'arts in the lobby, chandeliers made from the deep violet blue wine bottles in the exquisite Black Ginger (authentic Thai) restaurant, the spanner-like cutlery at my breakfast table, the off-beat metal garden sculptures, to the exposed plumbing and nuts and bolts toilet roll holders in the bathroom of my Pearl Bed suite. There is a valid explanation for its industrial edge. In redesigning the popular Pearl Village Hotel, (which reopened as the Indigo Pearl in December 2006) architect Bill Bensley and Australian industrial artist John Underwood drew inspiration from Phuket's 100-year-old tin mining heritage. Exposed wooden beams, smoked glass, polished cement floors, blackened stainless steel benches with brass rivets, floral art combined with raw silk touches the spectrum of a memorable holiday sunset adds texture and lustre to this five-star beachside hideaway. There are 277 rooms varying in style, space and opulence, from the Kelly Quarters with terraces over looking lush tropical gardens and pools; Plantation villas with private courtyards, outdoor baths, showers, and day beds; Pearl Bed Suites - some with private pools and garden pavilions to the ultimate one-and two bedroom Pearl Shells suites. 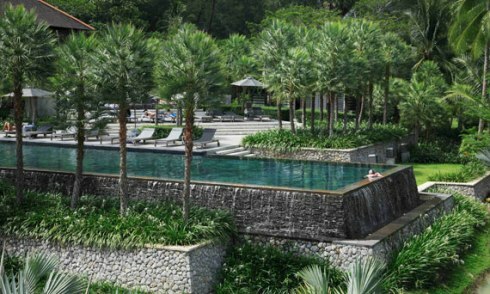 Indigo Pearl's much anticipated new Private Pool Villas (also Bensley-designed) will open in December 2011. Part of the resort's multi-million dollar transformation into an 'all suite and villa' property. Each of the seven Private Pool Villas is set within a walled garden and comprises of two pavilions (one for sleeping zone, the other a living space) - as well as a private swimming pool. The décor of the villas is 'industrial chic' like the rest of Indigo. Expect polished metal, exposed beams and riveted furnishings. The bedroom pavilion has a king size bed and his and hers fixtures - the bathroom has indoor and outdoor shower, with COQOON Spa branded toiletries, Jacuzzi and walk-in wardrobe . Despite its recycled ambiance, there is every convenience a discerning guest requires. Outside, the Andaman Sea breezes drift over the beach and fan guests lounging beside the resort's three lagoon pools. Indoors, traditional punkah ceiling fans help create an illusion of cool. But it's really the ducted air conditioning that's the real blessing in disguise. When it's time for lights out - the master switch is also conveniently at your fingertips. Hi-speed wireless internet access, flat screen TVs, mini-bar and 24-hour room service are complimented by a range of public resort facilities including a DVD library, and gym offering pilates, fit ball, stretching, yoga and tai chi classes. Home-grown coconut milk, sea salt crystals and seaweed dominate the IN-DI-Go Spa's range of body wraps and scrubs but don't miss a massage. Just book well ahead on wet weather days or you'll have to try your luck at one of the small massage parlours wedged between rows of cheap and cheerful bars and restaurants, dive and tour shops lining the road you have to cross to get to the beach (the resort's only significant downside). A massage in Thailand is like afternoon tea in Devon, a broadway show in NYC or betting on Australia's Melbourne Cup - it's a must-do. If shopping is more your style- you don't need to drive an hour into Phuket's main town for a healthy dose of retail therapy. But come prepared for excess baggage. The resort's Stock Room's must-have souvenirs range from Thai antiques, silk, artwork, china, exquisite jewellery and glassware. Like so many hotels these days, chances are if you like the furnishings you can buy it - and that's also true here, right down to the designer tableware and cutlery. There's a wide choice of dining options from the casual Rivet Grill, to the dazzling silk and silverware affair in Black Ginger restaurant. Don't just come for the food but the setting - the restaurant is exotically housed in a dark timber pavilion guarded by elephant sculptures and surrounded by tranquil lotus ponds. For casual drinks head to the open-air Rebar - above Rivet Grill - especially at sunset. The Tongkah Tin Syndicate, a designer bar/snooker hall, is a hip spot to enjoy a cold beer or a colourful cocktail, catch a major sporting event on TV, sink a ball, and yourself into a lounge chair to share the day's events and twitter over the walls crammed with more antiques gathered from the island's tin mining heydays . Check in: Nai Yang Beach & National Park, Phuket, 83110, Thailand. Tel: +66 (0) 76 327 006. Ultimate Luxury: The Bensley Suite with private pool, garden courtyar or the new Private Pool villas. Insider Secrets: 007 Roger Moore visited the region during the filming of The Man with Golden Gun (1974) in nearby Phang Nga Bay. Other famous names to grace these shores include Leonardo di Caprio -during the filming of The Beach, Renee Zellwegger (Bridget Jones Edge of Reason) and 007 Pierce Brosnen and his bond girl Michelle Yeoh (Tomorrow Never Dies). Junior Luxies: Kids Club. Open seven days for ages four and up with activities like forest walks, sand sculpture and batik painting. Dress code: Smart casual resort wear - cool (preferably) uncrushable fabrics. Perfect luggage: A silver Vapour carry-on from Tumi. The industrial look suits the destination.